The vehicle towing a trailer careened off the road breaking through a guardrail and ran into a creek, the Kansas Highway Patrol said. 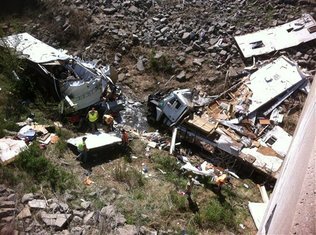 13 people were living inside of the freight liner truck which was outfitted with couches and living quarters. The crash happened off Interstate 35 in Osage County in eastern Kansas Sunday morning.